The 1980's are remembered for a lot of iconic trends, like big shoulder pads and skinny ties, movies about angsty teenagers, and terrible soft drink ideas. Cars got sharp edges, music went hi-tech, and malls became hangout spots. And it suddenly became cool to wear neon colors all the time, instead of just as safety equipment or when jogging at night. It's certainly a big leap for fashion when accessories go from being shiny metal and covered in jewels, to looking like futuristic artifacts that have been recovered from a nuclear meltdown site. 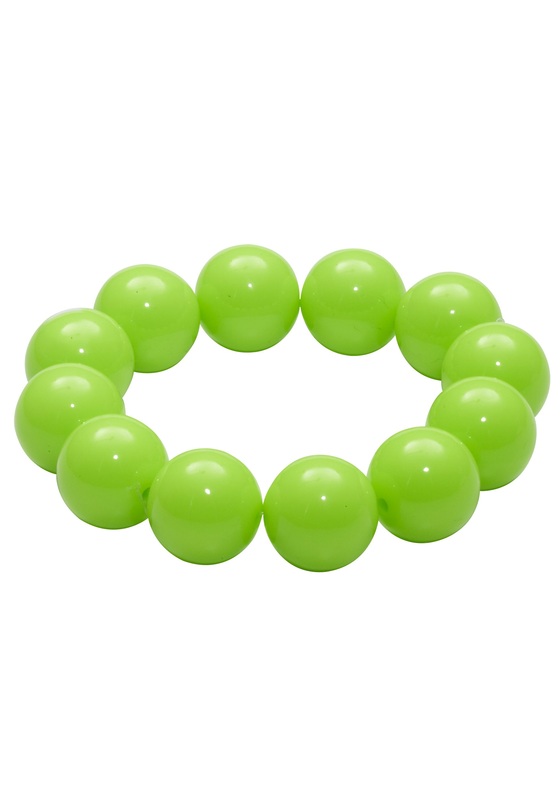 If you're looking to take a stroll down Memory Lane, or you want to start an 80's fashion revolution, one of these Green Gumball Bracelets will get you off on the right foot. The green plastic beads represent all the hallmarks of 80's style: smooth, simple, and almost unnaturally bright colors. Slip one of these puppies on, drop the needle on your favorite hair band album, and get ready to party, dude!